These buttons are from the 2012 Presidential election held on November 6, 2012. President Obama defeated Mitt Romney and was thus re-elected to a second four-year term of office. He is to be inaugurated on January 20, 2013. Barack Hussein Obama Jr. (1961- ) was elected to his first term of office as President of the United States in 2008. On September 6, 2012 at the Democratic Convention he accepted his party's nomination for a second term. The "Win the Future" Obama-Biden (Joseph Biden) button was an early 2012 support button, and sponsored by the Upper West Side residents of New York City. During the first Presidential Debate on October 3, 2012, Republican candidate Mitt Romney stated he would cut unessential items from the budget, such as PBS (Public Broadcasting Service), the home of Sesame Street and Big Bird. Two weeks later this Big Bird for Obama button was one of several versions being handed out at the Democratic Headquarters in Cumberland, Maryland. The "First Americans for Obama" button was issued during the 2008 campaign by the organization of that name and reflected Obama's Native American support. "Latinas con Obama" was among several buttons being distributed at a 2012 event in Austin, Texas, while the Obama rainbow button was distributed at the Baltimore Pride Festival in June 2012. In April 2012, the Obama campaign announced that "Forward" was to be their official slogan for the upcoming election. The 2012 International Chemical Workers Union Council (ICWUC) for Obama button was secured at a rally the author happened upon in Washington, DC in late October 2012. Mitt Romney (Willard Mitt Romney) (1947- ), a Republican, was elected in 2002 and served as Governor of Massachusetts from 2003 to 2007. He was an unsuccessful candidate for the Republican Party's nomination for the 2008 Presidential election. On August 30, 2012 he accepted the 2012 Republican Presidential nomination. January 20, 2013 is the date of the inauguration, and the "DONE" button shown here prophesies the defeat of President Barack Obama. In July 2012 President Obama in a speech arguing that the rich should pay more taxes stated, "If you've got a business, you didn't build that. Somebody else made that happen". Whether taken out of context or not it conveyed a message that the Romney campaign quickly seized upon with the rallying cry, "Government Didn't Build My Business - I Did". Romney's wife, Ann, is also portrayed her with her husband on an official button sponsored by the Mitt Romney campaign. 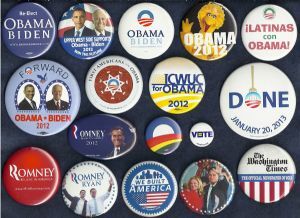 Romney's 2012 campaign slogan, "Believe in America", appears on several of his official buttons. The slogan was first used in April 2011. Romney's father, George W. Romney served as Governor of Michigan from 1963 to 1969, and was an unsuccessful candidate for the Republican nomination for President in both 1964 and 1968. Romney's running-mate for vice-president is Congressman Paul Ryan of Wisconsin. Ryan was elected to the House of Representatives in 1998, began service in 1999 and is considered an expert in fiscal and budgetary matters. A campaign button which has two portraits side-by-side, usually depicting both the Presidential and Vice-presidential candidates such as the official Romney-Ryan button shown here, is called a "jugate". The Washington Times "The Official Newspaper of 2012" button was handed out at the Americans for Prosperity "Defending the American Dream Summit" held in Washington August 2-4, 2012, while "Vote" is a button issued by the Human Rights Coalition, a civil rights organization which has as its cause equality for lesbian, gay, bisexual and transgender Americans. Campaign paraphernalia, United States, History; Presidents, United States, Election, History..